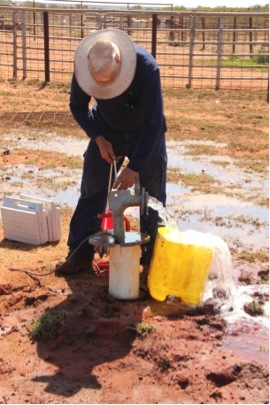 Dr Richard George is a Principal Research Scientist with the Department of Agriculture and Food WA, and leads major projects and water science areas. He and his small team have recently completed the land and water assessments that lay behind the approval of Ord Stage 2 and have other major projects underway in Kununurra, Carnarvon, and the south-west. Richard’s role is to underpin the expansion of irrigated agriculture in the North with the science to ensure the land and water remains productive for generations and has a long history in ‘making science make sense’ for agricultural industries. The La Grange Project stretches across 300km of country from Mandora Station to the south and Roebuck Station in the north of Western Australia. Can you imagine how in the world you could monitor and track anything over such a large expansive area? Well technology comes to the rescue and provides help – from above. 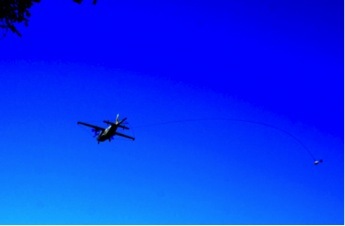 Plane with transmitter cable slung around the external wing, nose and tail siting at Broome airport. A pulse of energy is sent into the ground from a height of 120m from the cable and picked by a receiver, like an echo. The project consists of several broad areas of work such as tenure pathways and diversification, economics of irrigation and in particular, to understand how increased land and water use might affect the environment and its values. The project area includes all of the pastoral stations, Native Title determination areas for Karrajarri, Yawuru (Rubibi), Nyangumarta and Yawinya people and existing irrigation businesses at Shelamar and Shamrock Gardens. Because the area is vast – at almost 10,000 km2 – and contains remote and difficult terrain to access, the project team decided to begin the water investigations with a survey of the aquifers using a plane. However this is no ordinary plane as it contains an electronic data collection system that can look into the ground to depth of up to 300m! The plane has a cable strung around the wings, tail and nose that generates a current in the ground. Signals are received by a towed bird hanging off the back and influenced by how much salt, moisture, and clay is in the country. The La Grange survey flew over 6000 km of flight lines and collected samples at over 600,000 sites, taking data instantaneously from 30 depths from 2m to 300m. Data was collected during late 2012 and mid-2013. Partners in CSIRO processed the data. In April 2014, a two-day meeting was held to discuss the results, on the border of the Yawuru and Karajarri country, with pastoralists, horticulturalists, and Traditional Owners from the La Grange region. As a Department of Agriculture and Food (DAFWA) scientist I provided the maps and interpreted them. Maps, like the one below, showing differing depths and slices (sections through the ground) are typical ways to present the 30 layer data. This map shows the ground from the coast (left) to over 150km inland. Dark blue is land surface, Pindan soil and upper fresh aquifers (flow is direction of dark arrow) while orange and red represent more conductive or saline layers (clay or saltwater). On the coast, the red ‘ramp’ is the salt-water interface – showing salty water comes inland 2-10km. Project scientist Bob Paul (pictured below) presented results of a field survey of over 300 bores and windmills. While over 150 water samples were taken for detailed chemistry. Results indicated that more than 75% of samples were very fresh and little or any chemistry-related issues were found. Bore salinity levels were compared with the airborne mapping and the two were closely related – making predictions of salinity in areas without bore data is now possible. The project is entering the next phase, with installation of monitoring bores, soil mapping, and discussions continuing over the next two with landholders to map a shared pathway for agricultural development.